Modern home cooks are concerned with getting healthy food on the table quickly, and Better Homes and Gardens The Ultimate Quick & Healthy Book offers the perfect solution. Included are 400 recipes ready in 30 minutes or less, and every main dish has fewer than 450 calories and 15 grams of fat. 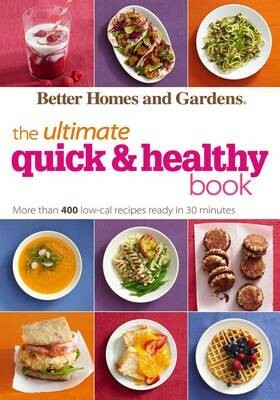 This book proves that quick cooking and healthy cooking can be synonymous. There are recipes for every occasion, from breakfast to dinner to make-ahead meals and entertaining. Every recipe includes full nutritional information and handy icons that highlight Superfast, No-Cook, Vegetarian, and Heart Healthy dishes. With more than 180 full-colour photographs, the book is as beautiful as it is practical.